How can gaming affect your brain and biological acuteness? It is an on-going argument about the effects of gaming. Dr. Bavelier share a laboratory analysis of how gaming can improve your sight, awareness and other biological skills. This article rang a bell for me because the author talked about a student who "was really frustrated because I was making her think." I know that this is true because I have experienced this myself. I teach courses in an unconventional manner where I want to see the students explore the world and then make decisions on their own. I have had students in tears saying "Why can't you just tell me what I need to know and then ask me on a test on Friday?" The key to creating successful 21st Century Learning Environments is to pose difficult questions that require learners to make decisions and explore the world. Read the article to see if anything rings true. Do you have additional resources or ideas you want to share? School Visitations: When I had finished the interviews with the superintendents, my first observation was that the decision to implement a 1:1 initiative was not made in isolation. Without exception, a factor that influenced the superintendent’s decision was visits to others schools that had implemented a 1:1 initiative. All the superintendents I interviewed told me that they had sent teams to schools that had already implemented a 1:1 initiative to see for themselves, firsthand, a program that was already in place. These teams consisted of teachers, administrators and in some cases school board members and students. The number of visits each team made to other schools ranged from 3-20. Political Considerations: The superintendents also talked about the multiple efforts they undertook to work with staff, school board, parents and the broader community to engage and keep them informed of the progress of the consideration. Most superintendents assumed the students would be receptive to the idea, but in one instance, students got the notion that once the computers arrived, all the teachers would be fired and students would receive their education strictly via the computer. So, a lesson learned was not to overlook the students and to enlist them in the exploration process. Equity: Equity was another factor that influenced the superintendents in the study in their decision to implement a 1:1 initiative. The superintendents talked about equity in terms of equal access to learning opportunities for all students. These opportunities included access to technology and online resources. Staff Readiness: The superintendents in the study indicated staff readiness was an additional factor that influenced their decision. Staff readiness fell into two categories. 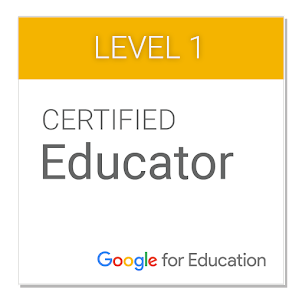 The first was characterized by the staff being open to or supporting the idea of implementing a 1:1 initiative. The other category of staff readiness was their comfort using the technology. There was a consensus among the superintendents that staff would need to gain further technology skills, but none of the superintendents were held back because of the technology skill level of the staff. Districts were also on a continuum of teacher possessing the pedagogical skills required to teach in a one-to-one classroom. But all superintendents felt their staff could gain this understanding through training and experience in the one-to-one classroom. Student Engagement: This was an important factor in the decision. One superintendent remarked that “when we observed and went to other schools and we saw student involvement in the classroom, that became our number one thought. What a wonderful thing—you have 27 kids in class, everybody is involved, everybody is interested.” Even once implemented, when the students told the administration in one district that they were not using the computers enough, the district’s response was to send the students to another district that was using the technology successfully. Students wanted to be engaged and after the visit to another district, they returned to their district and helped design changes in the classroom that increased student engagement. This was also cross-referenced using Wordle, an online tool found at http://www.wordle.net/. When the transcripts of the interviewee’s answers were displayed in Wordle, “important” and “kids” are used most often and thus, appear as the largest words. The words that were used most frequently after that included “students,” “involvement,” “education,” “everybody” and “projects.” In contrast, when asked, “as you reflect on the various factors that influenced your decision to become a one-to-one school, what was the least important?” the word “kids” does not appear. As the map of 1:1 districts in Iowa continues to add more schools, there is a likelihood that many of the factors discussed in this piece influenced the decisions to implement the 1:1 initiative. And it’s good to know that these decisions are not being made to “keep up with the Jones” but rather to do what is best for students. Here it is . . . I have been wanting to use the Vlog (Video Blog) format for my blog for a LONG time so I decided to do it today to tell you about an AWESOME experience I had in class last Tuesday night. I teach two 1.5 hour online courses on Tuesday night through Adobe Connect. These are video conferencing sessions that allow the students and me to keep a connection that we wouldn't have otherwise. This past Tuesday, I was meeting with my Emerging Instructional Technology class. This is a class of 15 students who are a mixture of Masters students and Undergraduate students. Good group of people. I had decided to spend some time getting feedback about how the class had been running. I received the typical feedback about too much work, but as we probed their comments we found that there was a difference between the perceptions of the undergraduates and the graduates . . . I am not going say anymore or you won't need to watch this 7-minute video. Tell me what you think and whether or not I should continue with periodic vlogs like this. 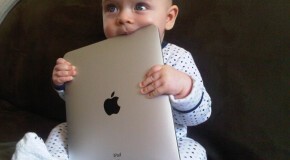 Internet: Pacifier of Digital Natives? Is the Internet the Digital Pacifier of our Digital Natives? This is a question that was posed by Bill Lammers. He conveys an incident in his high school classroom where the students were working intently on their assignments when . . . suddenly . . . the Internet Died. Some students squirmed because they didn't think that they would be able to work on their assignment without the Internet. Others squealed in delight when they realized that they didn't have to work on their assignments but moaned in anguish when they decided that they "couldn't do anything else" because their window to the world, The Internet, was down. 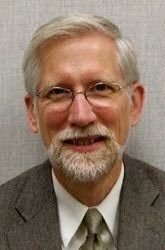 Blammer (Bill Lammers) makes an interesting observation when he notes how tied to the Internet his students were. 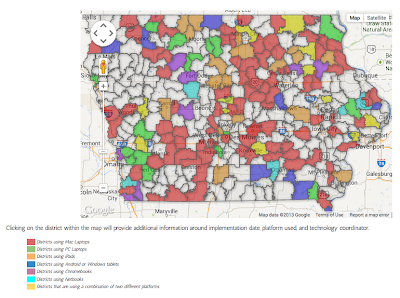 I was talking with a reporter the other day who told me that some of his interns were literally lost without their GPSs. They had no problem finding places when their smartphones had full access to the web, but they had no idea about how to read a map. They had no idea how to find north and what all of the squiggly lines on the map meant. Is this a crime or merely a Symbol of the Times? What do you think? 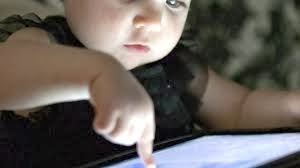 Read Lammers' article and then join in the discussion here about being connected to the world through the Internet has changed the skill set for our digital natives. What About Teachers as Digital Natives? A minute isn't what it used to be . . .
We used to hold our breath for a minute. Now we upload 72 hours of video on YouTube. We were excited if we could stand on one leg for a minute. Now we upload 20,000 new images on Tumblr. We could boil 1/3 of a 3-minute egg in a minute. Now we have 20 million photo view on Flickr. What do you do in a minute? Wondering what your superintendent is thinking? Gallup was thinking the same thing, but they asked them. This was all described in their What Superintendents Really Think report. They wanted to know what they thought about Common-Core Standards, Education Beyond High School, Affected Areas in Budget Cuts, and Technology in the Classroom. What do you think? Do these results match your superintendent's opinion last time you spoke with her/him? 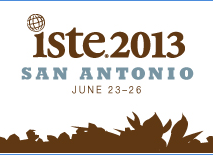 Well, I'm back from the ISTE '13 conference in San Antonio in late June. We had a wonderful time. Gaming was the theme of the conference and it was exciting to see Joan McGonagal talk about how life changing gaming can be. She autographed my book with "Play with Purpose." One of my highlights was my opportunity to share my ideas about Making Learning Meaningful to Millennial students. I was honored that ISTE decided that my presentation should be video broadcast to those who couldn't make the conference. These broadcasts were recorded and are available through the ISTE channel on YouTube. I decided that instead of providing a lecture full of facts and platitudes about what Meaningful Learning meant, I would provide a framework for the content but it would be more important to create a learning environment that demonstrated what we were discussing. I was quite impressed with quality of the video production. Thank you for your work. What do you think? I think that it went well. Were you there? If so, how did you like it? 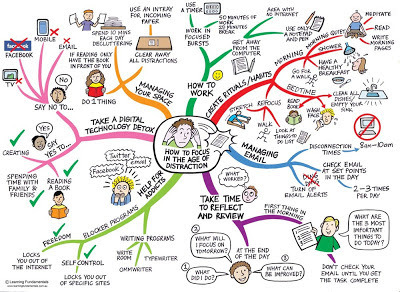 Do you ever feel like you live in the Age of Distraction? 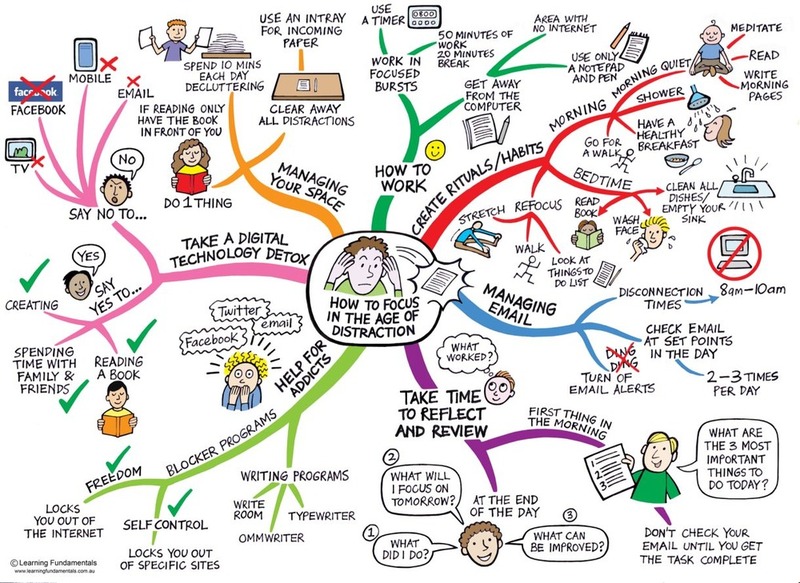 This is an interesting diagram that suggests strategies for managing time, how to work, reflecting on your work, and managing your space. Some of the ideas are common sense and some are quite ingenious. Upon reviewing the Learning Fundamentals website, it turns out that they have a collection of such Mind Mapping Diagrams that address: Getting Motivated, Getting Ready for Exams, Mindmapping, Busting Procrastination, Getting organized and a whole lot more. I will probably be including them in the future, but you can take a look at them at the link above. If you use them, remember to follow their Licensing Agreement. If you find this or any of the other maps useful, please share with us how you used them. Mind Mapping. Is it useful? 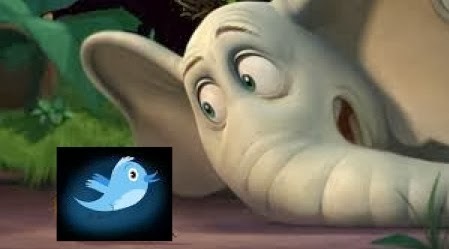 The Social Media World is huge and ever-exploding. 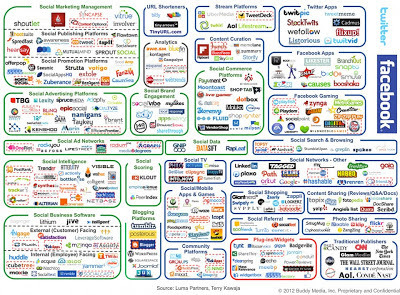 I was just reviewing graphics on social media when I came upon this Social Media Landscape infographic from the All Twitter Blog. 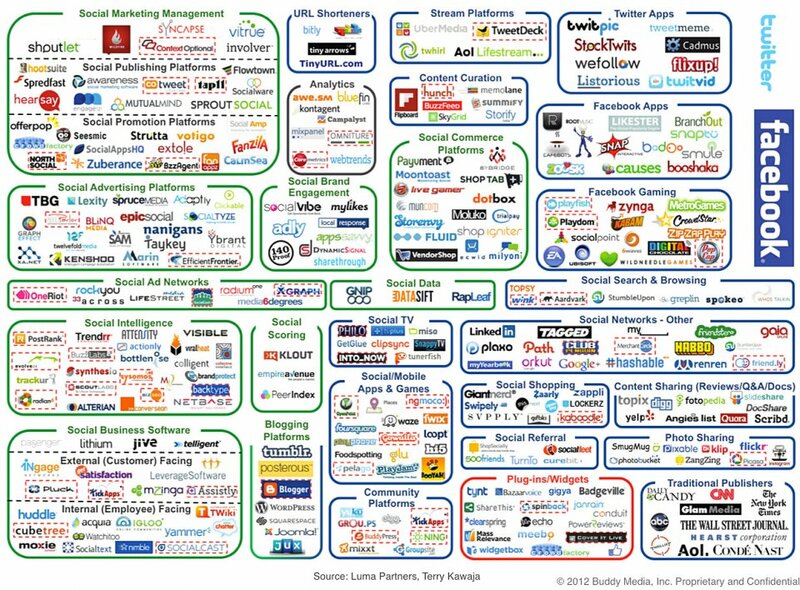 I found this graphic most useful by reading the topics to better understand the multiple aspects of the Social Media Landscape. Once you have an overview of the categories, explore the apps that are mentioned. Unfortunately, there are a few recent additions to the SM World that are not included (like Pinterest) but that will be included in Version 2.0. How will you use this Infographic? This business card infographic was brought to you by Staples.